Who or What Is a Social Host? Provides alcohol to another person as an act of hospitality, with no money being formally exchanged in a sales capacity - such as in bar, restaurant, liquor store or commercial enterprise. Has no particular relationship with the guest, such as an employer and employee. Provides alcohol to the guest or otherwise permits or allows alcohol to be consumed on property or premises that the host of the party either owns or controls. In Massachusetts, the mere act of providing alcohol and permitting its consumption is sufficient to result in liability. The property that is involved is usually a home, but not always: The property where the event or party took place can be any property that the host either owns or has control over. It can be a boat, a beach property, even a rented property such as a hotel room. What Is Social Host Liability, and How Does It Differ From Dram Shop Liability ? The law of social host liability expands liability for injuries caused by drunk driving accidents and other accidents caused by alcohol, from the person who actually caused your injuries, to the person who served that individual the alcohol in the first place. For example, if "John" hosts a party at his home where he serves alcohol, and "Jim" attends the party, becomes intoxicated, drives home and injures you in a Massachusetts drunk driving accident, the law of social host liability can make the party host, "John," liable for your injuries in addition to "Jim." This body of law does not relieve "Jim" of legal responsibility for your injuries, it simply allows the person who served "Jim" the alcohol, to be held legally responsible also. In essence, it expands the scope of potential defendants in a Massachusetts personal injury case such as this. This expansion of civil liability to the social host reflects the judicial view that anyone serving alcohol has a legal obligation to the general public to serve alcohol in a safe, responsible and prudent manner. While most people think of the host of a party or social event as being an adult, it is important to note that the legal definition of a "social host" includes both adults and minors. Where Did this Law Come From, and How Old Is It? Interestingly, prior to 1984, there was no such liability in Massachusetts: A person injured by someone who had been drinking at a commercial business such as a bar or restaurant could sue the bar or restaurant in addition to the person who actually caused the injuries (usually a drunk driver,) but the victim couldn't do the same if the drunk driver had been drinking at someone's home. That changed in Massachusetts in 1984, in the case of McGuiggan v. New England Telephone and Telegraph Co., 398 Mass. 152, 162 (1986). In that case, where an innocent third party was killed in a Massachusetts car accident after the driver became intoxicated at a graduation party, the Massachusetts Supreme Judicial Court embraced the theory of social host liability that other state courts had already recognized at that point in time, ruling that a social host was indeed liable for having negligently served alcohol to an adult guest in his home who was visibly intoxicated. That intoxicated guest later caused the wrongful death of an innocent third party and the court ruled that the party host who served the alcohol owed a duty of care to the victim in that accident. That duty was one of reasonable care in serving and providing alcohol to social guests. The court made clear in McGuiggan that the duty of care which gives rise to potential liability is grounded in the social host's particular ability "to control the liquor supply," and that liability cannot be imposed unless "the alcohol being consumed belongs to the host." As a result, liability is typically not imposed in these social circumstances unless the host had custody and/or control of the alcohol. The question boils down to, "Who was it who had the ability or authority to shut off any more alcohol to the person who caused the victim's injuries, when it became reasonably apparent that this person was intoxicated?" Suddenly in 1984, gone were the previous ways of just throwing a party, and letting the alcohol flow freely. In this landmark case, the Supreme Judicial Court recognized and affirmed the existence of a social host's legal duty to prevent harm to innocent third persons "where a social host… knew or should have known that his guest was drunk, but nevertheless gave him or permitted him to take an alcoholic drink." The law of social host liability does not exist by statute in Massachusetts: In other words, the law is not the product of a legislative act. This is called decisional law. So Far, What I'm Reading Here Is That If A Guest Drinks In My Home and Then Injures or Kills a Third Person, I Can Be Held Liable. What If The Guest Injures Himself - Would I Be Liable Then? In what confuses some people, the law in Massachusetts states that a private host does not owe a duty of care to an intoxicated guest who later injures or harms himself as the result of that intoxication, even if that guest were underage. The underlying rationale for this is that the courts have determined that it is the guest, so long as he/she is not under 18, who is in the best position to prevent harm to himself. The legal rationale for this conclusion is based largely on the victim's own voluntary consumption of alcohol and a responsibility to oneself. Does Massachusetts Social Host Liability Apply to Adults Only, Or To Minors and Persons who aren't yet 21 years old ? Both adults and minors. If your underage son or daughter provides or furnishes alcohol to another person, and that other person becomes intoxicated and caused injuries to a third party, liability can result. What If I'm Away and My Underage Child Hosts a Party - Would I Still Be Civilly Liable Under Those Circumstances ? Potentially. If a reasonable person would have believed that minors (anyone under age 21) would consume alcohol in your home when you were not there, you can be held civilly liable. Importantly and interestingly, though, Massachusetts law does not attach civil liability to parents of underage minors who serve alcohol, unless the parents actually supplied the alcohol that was consumed by underage guests. For example, if you as a parent bought or provided the alcohol that was later consumed at a party held by your underage children, and a reasonable person would have known that in your absence the alcohol would be consumed by underage persons, then you could be held liable. If an underage person consumed alcohol on your premises in your absence, but you had not provided or furnished that alcohol (for example, the underage drinker brought his/her own,) and you had no knowledge of the party, then it is very unlikely you would be held liable. What If My Underage Child Was Drinking At Another Person's House and Then Injured Someone - Would I Be Liable Then? Depending on the particular facts present, you might still be civilly liable under these circumstances, if you had given some kind of permission - explicit or tacit - for your underage child to consume alcohol on someone else's property, and he or she then harms a third party. Shielding yourself from liability in these circumstances is often not as easy as you'd think. Will Renting A Hotel Room For a Party Protect Me From Liability? Sorry, no dice. If you rented the hotel room, you would be legally judged to have “control” over the activities within the room. The law applies to anyone in control of the affected property or premises. 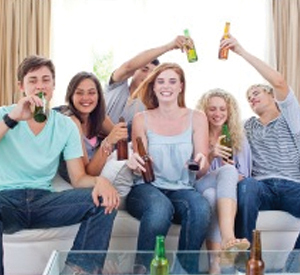 Can I Be Arrested or Charged Criminally If An Underage Was Drinking In My Home? What About Insurance: Will my Homeowner's Or Renter’s Insurance Cover Me If I’m Sued and Found To Be Liable Under This Law? It depends. If you are charged under any criminal statute, your insurance company will very likely deny coverage. I advise all my clients to carry umbrella insurance on their homeowner’s policy over and above their primary liability limits. Without a very high umbrella policy, if coverage does apply, it’s unlikely that the average person’s policy limits for liability claims would be sufficient to cover what are often very substantial damages that can be awarded when death or catastrophic injuries result in these cases. If you plan to host a party or event where alcohol will be served, you should be aware of all of the above. If a guest is over-served alcohol and causes injuries to someone else, you may be on the legal hook in a financially very serious, life-altering way. Don’t be foolish: If you’re going to serve alcohol to your guests, whether it’s a Christmas party in December, a July Fourth cookout, or a graduation or wedding reception, do not just “let the good times flow”: Monitor your guests’ alcohol consumption. Keep your eyes and ears open. And take away anyone’s car keys who seems impaired. Better to suffer an argument than suffer a horrible tragedy. Boston, Massachusetts Social Host Liability Lawyer: Why Hire the Law Office of Attorney William D. Kickham To Represent Me In My Social Host Liability Case? If you or someone you know has been injured as the result of a Massachusetts drunk driving accident or has suffered a personal injury as the result of someone being over-served alcohol in another person’s home or residence, that person is going to need to retain a talented and experienced Massachusetts social host liability attorney – one who has a proven track record of success in winning these kinds of cases in Massachusetts. To hire a lawyer who handles these complex cases only “now and again” would be a foolish decision, and anyone who would do so is inevitably going to regret that decision. In the legal profession, as in any profession, “experience and proven results” mean everything. At the Law Office of William D. Kickham and Associates, our Massachusetts Injury attorneys have many years of experience representing individuals and families who have been injured due to a person being over-served alcohol in someone’s home. Whether the injuries involve a car accident, a fall down accident, or any other accident that resulted from someone being over-served alcohol in a home, we know how to maximize the chances that the responsible parties involved will compensate you for resulting damages. Achieving success for injured plaintiffs in these cases requires not only talented and aggressive legal representation, but an expert ability to negotiate with the attorneys representing the defendants who are sued, and proven experience in dealing with the liability insurance companies that are usually involved in these cases. Believe us, this kind of talent isn’t found with lawyers who aren’t very experienced with these types of cases. If you’re in a position now where you need to make a decision about hiring a lawyer to represent you in a Massachusetts social host liability case, don’t make a mistake that could cost you a lot later. We know how to try and how to win these cases, and our talent is among the best in Massachusetts. Call us 24 hours a day, seven days a week at Ph. : (781) 320-0062 or Ph. : (617) 285-3600, or email us here online for a free initial consultation, and we’d be glad to let you know what your legal options are, and what we can do for you. Our phone lines are answered and monitored constantly, and we respond promptly to all calls and emails. Westwood and Boston, Massachusetts alcohol liability lawyer William D. Kickham has appeared as a legal analyst on a variety of respected media, including Court TV (now In Session on HLN,) Fox News TV-25/Boston, The Boston Herald, WBZ-AM Radio 1030, WCVB-TV5/Boston, Nightside With Dan Rea, Greater Boston With Emily Rooney, Money Matters Radio/Boston, and The Metro Newspaper/Boston. Attorney William D. Kickham is turned to by respected reporters and media organizations in Massachusetts as an authoritative expert in the field of Massachusetts personal injury law, and the case results that he produces for his clients attest to this. Call us today at office number (781) 320-0062, or Atty. Kickham’s cell phone number at (617) 285-3600, to arrange for a free initial consultation of your case. If the matter is not an emergency, you can email us here and we will respond to you very promptly.